Record while playing along to songs, creating your own drum track and adding fills. Layer tracks on top of each other to make some crazy beats. Come on, you know every song can be made better with more ride cymbal. Drum Kit has been featured in iPod Touch TV commercials, billboards, and posters. It’s updated frequently, with new sounds, themes, and features. ★ Five different kits: Classic/Rock/Hip Hop/Techno/Dance and more coming soon! ♬ Tap the record and play a beat. Tap the stop button when done and give your track a name. 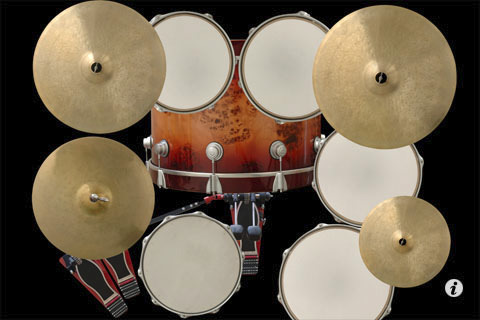 You can now slide your fingers across Drum Kit to play rolls. Turn on rolls in Settings and change the BPM (beats per minute) to fine tune your rolls. Try sliding in a circle around toms and snare for instance.